Localisation de ce monument - Situering van het monument: Victoria Embankment Gardens, Victoria Embankment. Coordonnées GPS - GPS-coördinaten: +51°30'31.40", -0°7'14.26". Le monument de la reconnaissance belge. Les Belges réfugiés en Angleterre ont décidé d'élever un monument en témoignage de leur reconnaissance vis-à-vis du peuple britannique. Le travail a été confié au sculpteur Victor ROUSSEAU; le monument se développe sur une longueur de 16 mètres ; sa hauteur centrale est de 6 mètres. Des deux côtés de l'hémicycle se sillouettent les figures de la "Justice" et de l'"Honneur". À droite, un chevalier bardé de fer, offre son épée à la Belgique. 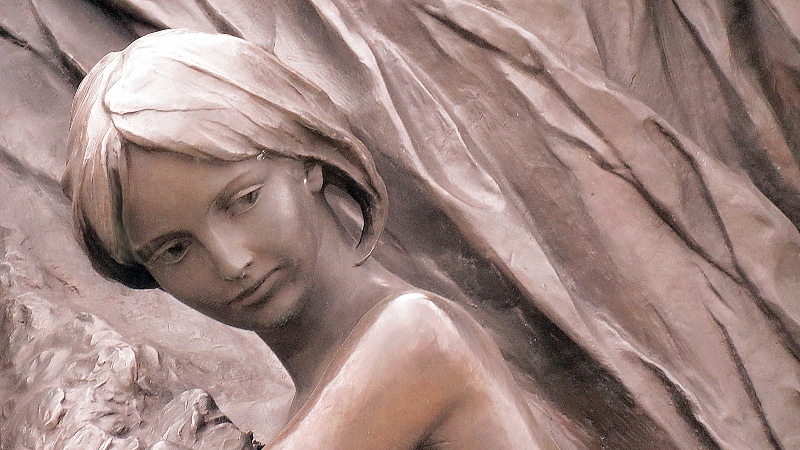 Le groupe principal, en bronze, (l'hémicycle et ses "reliefs" seront en pierre argentée de Portland), réunit trois figures: La Belgique, drapée de deuil, commentant d'un geste patriotique toute la bonté de la nation anglaise, se penche sur deux enfants (Source: "Le musée et l'encyclopédie de la guerre; recueil mensuel illustré de documents et pièces rares. Publié avec le concours des amateurs, collectionneurs, chercheurs, historiens, archivistes, bibliothécaires français, alliés, neutres", Tome II (Février 1917 - Février 1918), Directeur : J. GRAND-CARTERET). 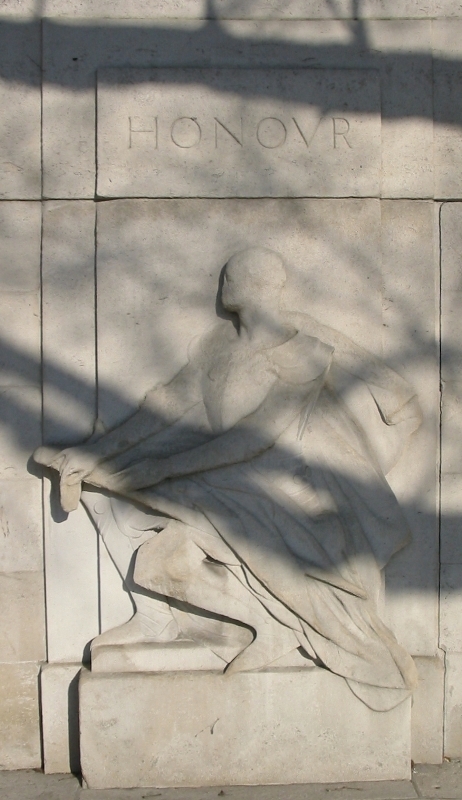 Belgian War Memorial: Dit memoriaal is opgericht om de Britse inspanningen bij de verdediging van België te herdenken. In de herfst van 1918 richtte men in Londen een comité op onder het voorzitterschap van twee Belgische prinsessen om dit memoriaal op te richten. Sir reginald BLOMFIELD ontwierp het memoriaal en de Belgische beeldhouwer Victor ROUSSEAU maakte het beeldhouwwerk. 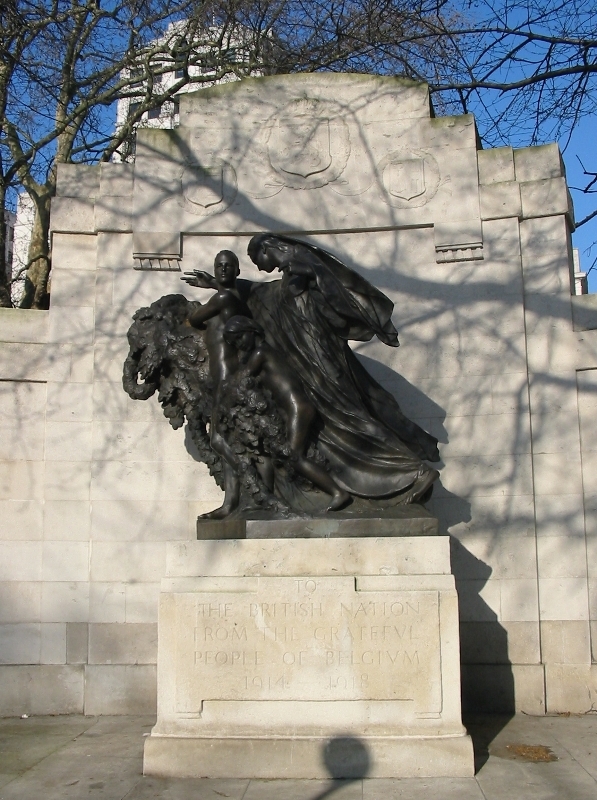 Het memoriaal staat aan Victoria Embankment, Londen (Bron: VAN DER AUWERA, Sigrid, "De herdenking van de Grote Oorlog en Flanders Fields. Een beknopt overzicht in 25 staten"). 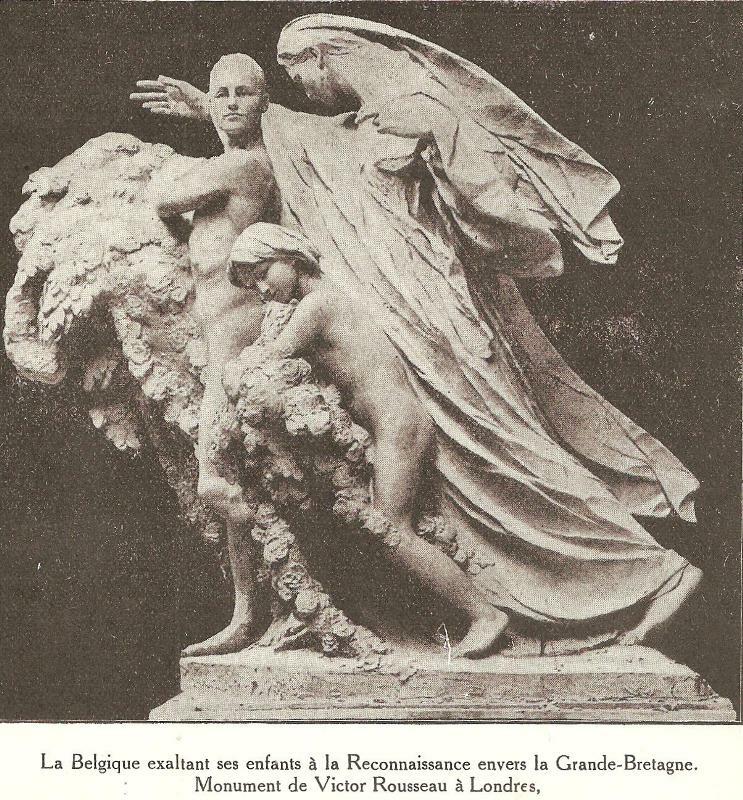 Belgian Monument to the British Nation. Also called Anglo-Belgian Memorial, this memorial was a gift from the Belgian nation to thank Great Britain for their assistance to Belgium in the 1914-1918 war. 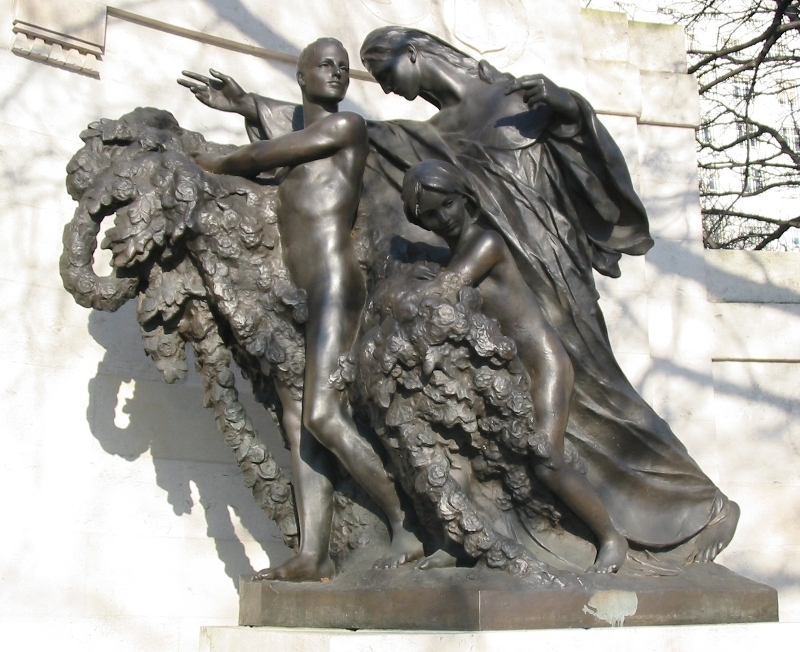 It was unveiled on the 12th October 1920 when Leon DELACROIX, the Belgian Prime Minister, offered the memorial to the British nation, the gift being formally accepted by Lord CURZON. The actual unveiling was performed by Princess CLEMENTINE of Belgium. 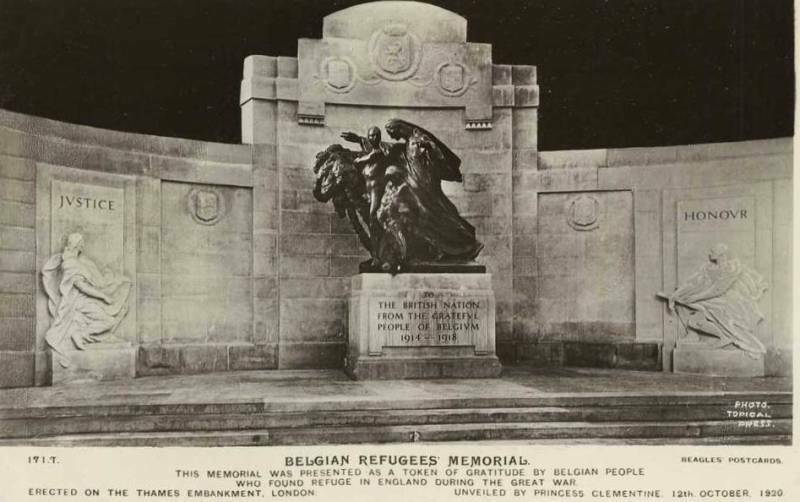 The memorial was erected as a token of gratitude by Belgian people who had found refuge in England during the German occupation of their country. The central bronze group was the work of the sculptor Victor ROUSSEAU and it emerges that a sculptor from the Royal College of Art called Francis was to work on the initial carving of the side figures representing "Honour" and "Justice" as well as the shields representing the regions of Belgium. ROUSSEAU would supply models of the figures and shields for Mr.Francis to work on, and would finish off the faces and heads of the two figures himself. There were nine shields in all and some wreaths. The shields represented Brabant, Anvers (Antwerp), Liege, Hainault, Namur, Limbourg, Luxemburg and two for Flanders. 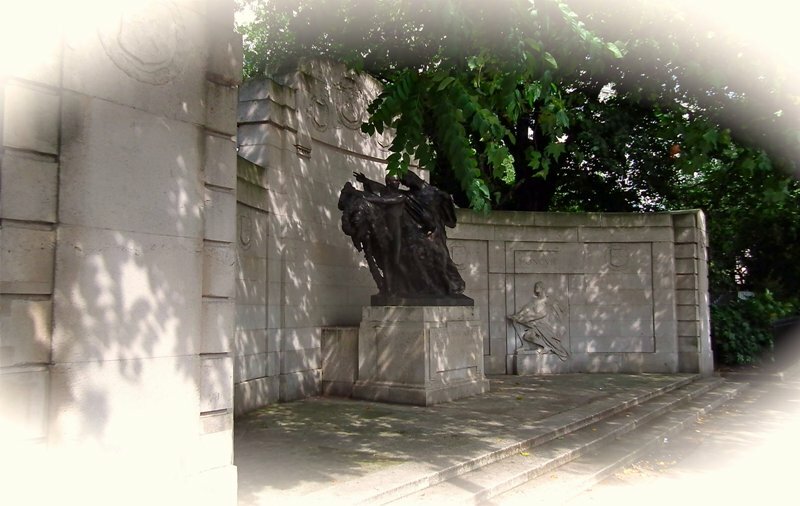 In July 1920, and whilst the memorial was still being worked on, intruder[s] had entered the site of the memorial and damaged the plaster models of the two figures of "Justice" and "Honour" and some of the shields with a hammer. Thereafter and until the unveiling, a nightwatchman was employed to guard the site. 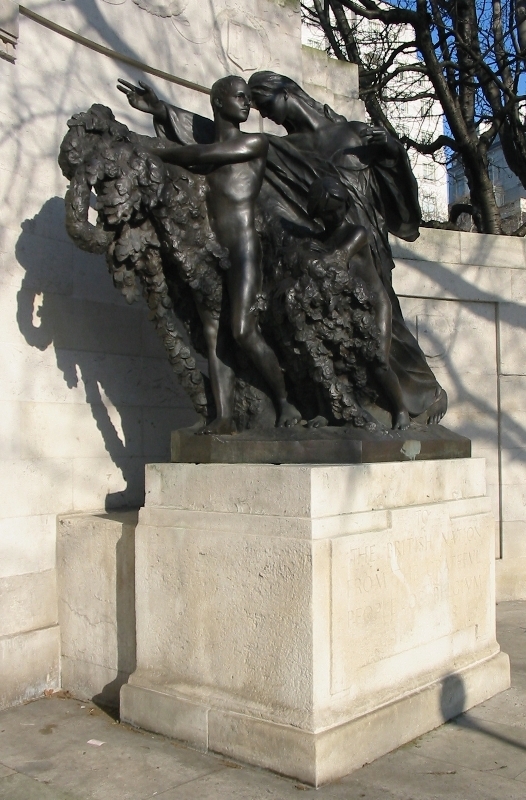 The memorial then features bronze figures representing a Belgian woman accompanied by a boy and a girl both carrying garlands. The inscription below reads "To the British Nation from the grateful people of Belgium, 1914-1918". 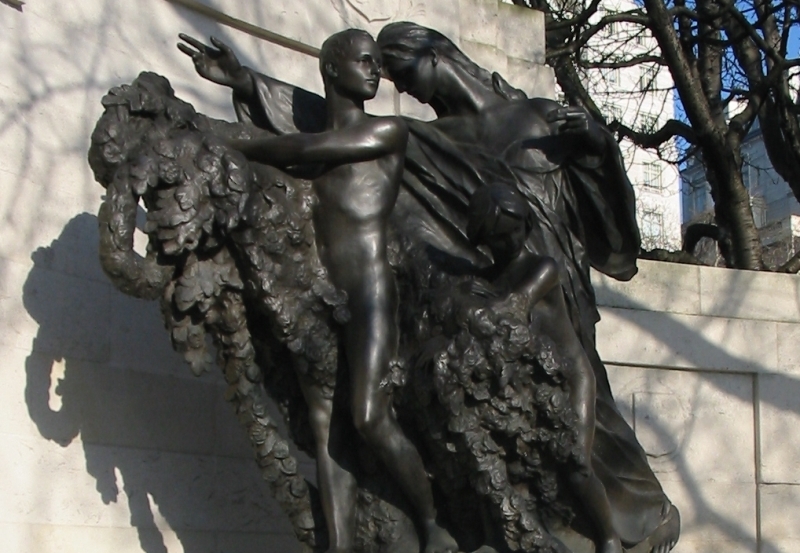 As part of the Portland Stone surround we see two figures of a man and a woman. One represents "Honour" and the other "Liberty". Sadly the figures have become worn after years of exposure to the London traffic as have the shields. The bronze remains a magnificent work it having at least weathered the elements. Victor ROUSSEAU lived from 1865 to 1954. He was born at Feluy-Arquennes, in the province of Hainault, the son of a stone-cutter. He studied from 1879 to 1880 at the Academie des Beaux-Arts in Brussels and won the Godecharle prize in 1890 which enabled him travel to England, France and Italy. He spent two years in Paris and several months in Florence, and returned to Belgium in 1894. 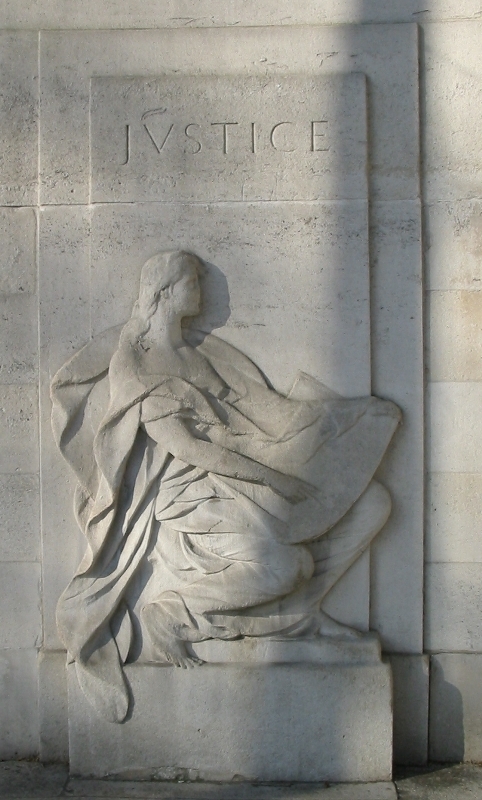 From 1901 to 1919 he was Professor of Sculpture at the Academie des Beaux-Arts in Brussels and its Director from 1919 to 1922 and 1931 to 1935. During his career exhibitions of his work were held in London, Madrid and the USA. He won the Grand Prix de Rome in 1911. ROUSSEAU has works on view in Brussels, Antwerp, the Chateau de Mariemont, Berlin, Vienna, Copenhagen, Liege and Glasgow. In 1926 Rousseau presented a statuette to the Chelsea Arts Club as a token of gratitude for the help given by the club to Belgian refugee artists during the 1914-18 war (Source: UK National Archives).